Good Luck Foods For New Year's Day-What's Your Tradition? New Year's Day brings the possibility of better things to come. Resolutions are made and bad habits are given serious consideration, especially if you find yourself pondering them over a glass of Alka-Seltzer. To ensure starting the year off the right way, people all over the world turn to traditional good luck foods on New Year's Day. Foods representing wealth, luck and success are a common theme ranging from donuts called Olliebolen in Holland-thought to represent coming full circle, to green coin shaped lentils in Italy- thought to attract wealth. In Japan, long soba noodles are eaten unbroken to represent long life. Sticky rice called mochi is pressed into rice cakes called omochi which are offered to the gods then cut into pieces and eaten by family member for wealth and good luck. Omochi are also served in a soup, called Ozoni. The Greeks make cake called Vasilopita. Each cake has a coin inside and the person who gets the coin is said to be blessed with good luck for the coming year. As I mentioned earlier, in Italy lentils represent money and are eaten with hopes of wealth for the New Year. Cotechino con Lenticchie is a traditional good luck dish of sausage served over lentils. The fatty richness of the cotechino sausage symbolizes abundance. In Spain, twelve grapes are eaten at midnight. With each stroke of the Plaza del Sol clock, a grape is eaten to celebrate lucky years past and to hope for good luck in the year to come. Here in America, we enjoy many food traditions often associated with the South. Greens, representing money, are commonly used in dishes with the hope of wealth for the coming year. Collard greens, mustard greens, kale and any type of cabbage can be used. Greens are often combined with pork (symbolizing prosperity) in dishes such as ham and cabbage and pork and sauerkraut. Hopping John, probably the dish most associated with the South and New Year's contains the beloved black eyed pea, also thought to represent coins and wealth as they expand when cooked. 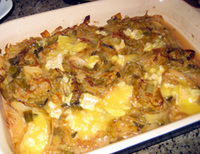 Here is a recipe for Savoy Cabbage Gratin with Saint-Marcellin. This dish is from Molly Stevens' "All About Braising". 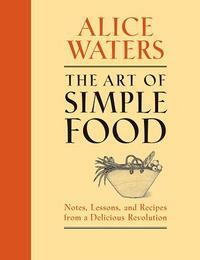 I highly recommend both the recipe and the book. The cabbage gets tender and steeped with flavor from chicken stock and the rich creamy Saint-Marcellin. 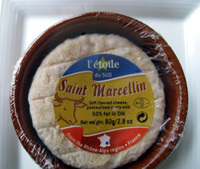 Saint-Marcellin is a soft cow's milk cheese with a mushroomy aroma. It's so soft in fact, the tiny wheels (about 3 ounce portions) come in a little crock. Saint-Marcellin comes from Dauphin in southern France. It's a salty cheese, so go easy on the salt when wilting your greens. Adding the cheese towards the end will bring the salt up to taste. For New Year's, I've stuck with tradition and served this gratin with marinated pan-seared pork chops and coin sized potato pancakes. In a large skillet, melt butter over medium-high heat. 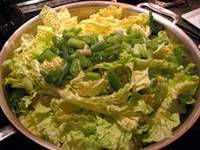 Add cabbage and scallion with a pinch of salt and several grinds of fresh black pepper. Saute, stirring often, until the cabbage wilts and begins to brown a little, about 10 minutes. Add chicken broth, bring to a steady simmer and scrape the bottom of the pan. Cook for 2 minutes. Scrape the cabbage, scallions and broth into a gratin dish (I used a 9x12 dish). Cover tightly with aluminum foil and place on middle rack of oven. Bake for 45 minutes. 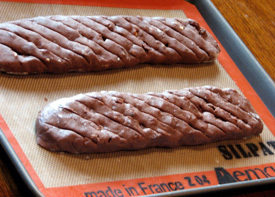 Remove foil and continue to bake for an additional 20 minutes until most of the liquid is evaporated. Cut or tear the Saint-Marcellin into small pieces and scatter into gratin. 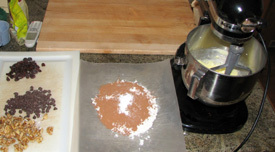 Increase oven temperature to 375 degrees and bake for 10 minutes until the cheese is melted. Serve hot or warm as a first course, a side dish or on it's own as a light supper. I had some friends from college in town for the weekend and we decided to go out for dinner and wander around Chinatown, but when we couldn’t find any movies worth seeing, we decided to go out for dessert. My friend Pat pointed longingly at a Haagen-Daz, but it was freezing out and we cold-weather wimps vetoed that. At the same time Pat and I thought of Poste. He’d been there for happy hour (as had I for brunch) and thought the food seemed promising (we both remembered the truffle oil french fries dusted with parmesan cheese...WOW!). The brunch I had there was really good, though I thought the service was a little snotty. I was eating with my mom then and I got the impression that our waiter was really disappointed not to have a hipper crowd at his table. Not surprisingly, I got the same vibe this time. My friends and I went to the University of Chicago—we’re not hip. Our idea of a good outfit for a winter night on the town is something in the black sweater, jeans and converse sneakers department. But, that’s my (our) fault, nor Poste’s. So we sat down and each ordered something different -- my friend Darcy tried a squash dessert that was not at all sweet (but was served with a little bit of coconut ice cream). She said it reminded her of the time her little sister tried to make pumpkin pie by dumping a can of the purée into a pre-baked shell. Pat got chocolate sorbet and vanilla ice cream (for about twice as much as it would have cost him at Haagen Daz -- a steep price to pay for loving ice cream in the winter, I guess), my friend Sarah ordered the poached pear and chocolate dessert and I tried the pistachio ice cream with pineapple chunks on top of a chocolate macaroon. Generally, macaroons aren't something I get really excited about, but this one was delicious. (I guess Poste is in a French hotel, so it's not surprising that their take on a French dessert would be impressive.) It was pliable and hard to eat without a knife, especially after the melting ice cream had made it kind of cold. The almond flavor in the macaroon went excellently with the pistachio ice cream (which thankfully was not bright green) and even the pineapple (which looked a little canned, although the room was quite dark) was okay. I'm not a huge fan of fruit with chocolate, so okay's pretty good by my standards. Living in the world of the continually diminishing dollar, we've all gotten used to the occasional price increase. But watch out beer fans, as you are about to see the prices of your favorite brews climb faster than the price of gas! By now many of you have probably heard about the international hops crisis -- in short, simultaneous crop failures at several key growers in Europe and the United States this year have made the price of hops quadruple over the course of the past few months. So okay, the prices go up, but surely supply and demand will yield a compensation! If only. 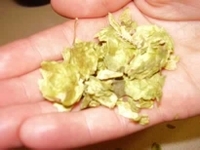 Humulus lupulus' slow development means that viable replacement stock (particularly of high grade 'noble hops') may be as much as half a decade in the growing! Add to this a recent warehouse fire which consumed a good 4% of the domestic hops stockpile, and we've got ourselves a major problem. A crisis such as this was inevitable and has been a long time coming. This latest manifestation is symptomatic of an American agriculture contrary to the production of craft beer. The only reason that failures at a small number of growers have affected prices so dramatically is that so few producers remain! For the small farmer, the siren's song of government subsidy must be nearly impossible to resist; if the government says it will pay them to let their land lie fallow or grow the much more tractable corn, then why shouldn't they? In the last decade, when hop prices had been relatively low, many producers found the lure irresistible. For this reason the crisis is actually twofold, as the same option had been presented to the Midwest grain grower, resulting in a dearth of maltable grains, the very foundation of all things "beer." What this means to the consumer in the short run is higher prices-- and we are talking as much as 25% in the case of some of your more heavily hopped, lower production beers. Expect your favorite IPAs to go up as much as $3 a six pack, and don't be surprised if less hopped but well established microbrews like Sierra Nevada Pale Ale and Anchor Steam cost an extra buck or two within the first months of the New Year. Imports should also see a marked price increase as European and Aussie producers are also feeling the pinch. Looking a little further down the line, you will likely see your favorite brewers curtail their offerings so as to get the most out of their diminished hops supply. 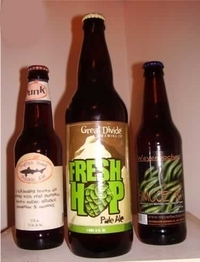 In order to keep their primary money makers going, infamously hop-mad producers like Dogfish Head and Stone may very well cull the less efficient but wildly popular high-end brews from their portfolios in order to focus on the simple lagers and ales that will keep them financially afloat. But the real tragedy here is in the long term, as not every brewery is going to weather this storm. Vying for a cut of the dwindling supply of grain and hops are some 1,400 domestic microbreweries-- not even taking into consideration the gargantuan needs of the Macros (Miller, Bud, Coors, et al) there is not nearly enough to go around. As current farmers' afflicted supply rehabilitates and (God willing) new producers begin production, many small but beloved producers will be left high and dry. If the names Weyerbacher, Southern Tier, Great Divide, or Anderson Valley ring any sort of bell, be forewarned: just as an artist is destitute without canvas and paints, so too are these specialty brewers and their ilk (artists in their own right!) left vulnerable without a steady and sustainable supply of material. Word on the street is that the Macros were well aware of the tough times ahead and as such will not be increasing their prices in the foreseeable future, thus making the life of the small brewer even more difficult. If you are an avid beer fan, a supporter of small business, and possessed of regional pride, now is the time to use your power as a consumer to make good on those beliefs. The Mid-Atlantic region is a hotbed of brewing activity, occupied by many an honest brewer in need of your support: do yourself a favor and seek out some of the great beers they have to offer. Clipper City Brewing Company out of Baltimore offers a fantastic line of beer which is widely available and appropriate to any palate. In Hampton, VA The St George Brewing Company produces an impressive lineup which includes a stout that would give Guinness a run for its money. The ales and lagers of Starr Hill Brewery are very impressive, and being brewed in Crozet, VA, they are the closest thing a DC native is going to get to a local microbrew since the sad departure of Foggy Bottom Brewery. Finally, though they likely need no introduction for even the novice beer connoisseur, Dogfish Head Brewery of Milton, Delaware, proud producer of some of the strongest, hoppiest beers on the planet, would certainly appreciate your continued support of their innovative, esoteric endeavors. With the belt tightening well on nigh, now is the time to start voting with your wallet. If you love the hop monsters, make it known so that their masters may have the confidence to keep them coming. If your tastes are more run of the mill, consider a locally-made beer over one backed by a well-heeled corporation. And even if you are drinking on a budget, don't balk at spending that extra dollar, not only for the benefit of your taste buds, but for the continuation of the American, nay, International tradition of quality, low-production craft beer, a tradition in great danger and in need of your attention. 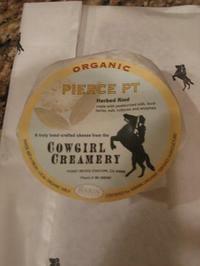 As I mentioned in my write-up of Cowgirl Creamery's DC location, there is a seasonal cheese produced by the Cowgirls called Pierce Pt. And as SB pointed out in her comment on that post the other day, Cowgirl Creamery is also one of the first stores in the country to carry jamón ibérico, a cured Spanish ham widely praised for its rich, smooth taste. On my recent visit to their shop, I picked up some of each and tasted them together. The Pierce Pt. remains a favorite, with its dried herbs adding complexity to the flavor of the cheese. But although I could appreciate the quality of the jamón, it failed to blow me away. Cowgirl Creamery's mission to celebrate all things artisanal begins at home with their own line of cheeses. They produce two cheeses year-round at their home base in Marin County (outside San Francisco): Mt. Tam, a buttery triple-cream, and Red Hawk, a washed-rind cheese with a pungent aroma and a deep, earthy flavor. And they are proud of their use of organic milk, frequently highlighting the fact that their supply comes from the nearby Straus Family Dairy. But they also produce two seasonal cheeses - one in the spring and one in the fall. 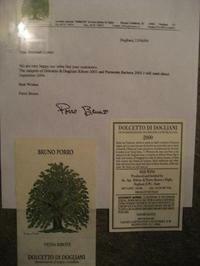 The first, called St. Pat, is wrapped in nettle leaves and has a smoky green flavor that matches its look. The second - Pierce Pt. - is my favorite of their offerings and the true hero of this post. Pierce Pt. is made from that same organic Straus Family Dairy milk, but it goes through a maturation process unlike most other cheeses. First, the rounds are washed in a muscato (their spelling) wine - a light, sweet white wine whose floral aromas and peachy flavor still linger a bit on the cheese. After this wine bath, the cheese is rolled in local dried herbs. Although no formal list of the herbs used is available, the woman behind the counter told me it included chamomile and fennel, and I tend to come away from tasting Pierce Pt. with a firm impression of bay. Regardless of the secret recipe, it is a celebration of local flavors and a great inclusion on any cheese plate as the weather turns cold. As it warms, the cheese softens from the outside in, taking on a texture somewhere between double-cream brie and raclette. As a seasonal offering, Pierce Pt. is only around in the fall and winter. By the time Cowgirl Creamery rolls out St. Pat in early March, it will be gone for another year. Pierce Pt. is sold in rounds and half-rounds by weight, with the average round weighing roughly a half a pound. At $22.75 per pound, you can expect to spend $10-$12 per round and $5-6 per half-round. Until very recently, jamón ibérico was not available in the United States. This Spanish delicacy was not approved for import into the United States until 2005, and this month marks the arrival of the first shipment. Cowgirl Creamery is therefore one of the first purveyors in the entire country to offer the cured ham. When SB mentioned its availability, it piqued my curiosity so I decided to give it a try. I did some reading and learned that jamón ibérico comes from Black Iberian pigs, one of the closest domesticated relatives of wild boars. The pigs feed primarily on acorns, grasses and herbs, and it is this diet that is supposed to give their meat its rich flavor and luxurious texture. There are several grades of jamón ibérico that are produced in Spain, but thus far only one grade is available stateside. The top quality ham - known as bellota (acorn) because the pigs are fed acorns exclusively in the final phase of their lives - is expected by March. The quality of the meat and its extreme rarity conspire to make this a gourmet's delicacy - though not quite on par with Kobe beef or white truffles - and the price tag reflects this. Cowgirl Creamery is selling their jamón ibérico for $75 per pound. At that price, each slice costs more than $2, making this a ham that must be savored on its own if it is to be truly appreciated. And that's where it lost me. I am a real fan of prosciutto di Parma - I love the taste and the way it practically melts in your mouth when it's sliced thinly. Jamón ibérico had a similar flavor, if slightly richer and more savory. But my experiences with prosciutto di Parma at price points below $25 per pound gave me an objective basis for comparison, and I simply did not find the jamón three times as good as the best prosciutto I had ever tasted. It probably didn't help that the slices I tasted were not thin enough to truly dissolve in my mouth, even after I had let them reach room temperature as the Cowgirls recommended. Although I'm glad I took the time to try jamón ibérico, I don't know that I'll be rushing out to buy it again anytime soon. Artfully Chocolate and Kingsbury Confections (ACKC) have teamed up to open the ACKC Cocoa Bar in the Logan Circle neighborhood of D.C. Normally, my territory for DC Foodies covers Northern Virginia, but these two local favorites drew me across the Potomac on a cold and rainy weekend morning. Recently, I was in search of a good cup of hot chocolate and spent some of my Saturday checking out places such as Misha's in Old Town and Murky Coffee in Arlington. When I arrived back home I found an email from ACKC. They were announcing, among other things*, their hot chocolate "Diva Drinks". 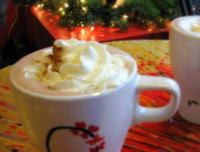 Eight hot cocoa specialty drinks with names such as Charro, Marilyn and Judy with ingredients like caramel, chipotle and raspberries. As the sky let loose it's last bit of pouring rain on Sunday morning, my husband Frank and I easily found a parking spot on 14th St. right in from of ACKC Cocoa Bar. As we entered there was a pleasant aroma of chocolate and coffee. The first thing I noticed were the walls, which are painted a bright bold red and are punctuated with whimsical artwork (by Eric Nelson). The artwork is carried over to the brightly painted cafe tables, many adorned with stunning orchids. A display table, with a crystal chandelier hovering like a tiara showcased scrumptious chocolate goodies. Several cases enticed us farther in with beautiful truffles and a variety other chocolate confections. We decided to head over to the espresso bar and order a couple mugs of hot chocolate to enjoy in the cafe area. Two hand decorated mugs held our hot cocoas. We ordered the Lucy and the Charro. The Lucy came with a healthy dose of cinnamon sitting atop whipped cream. Underneath sat chipotle pepper infused semi-sweet hot chocolate. The chocolate and spice complimented each other while not overwhelming. If you don't like spice, try this anyway. The smooth hot chocolate warms the palate as it goes down and the spice leaves a gently tingle in the back of the mouth and throat. The Charro is a playful combination of semi-sweet chocolate and caramel, topped with whipped cream and a Ghiradeli caramel sauce. The first thing I noticed about this hot cocoa is that it's not a cloying Starbucks Caramel Macchiato. The chocolate balanced the sweetness of the caramel and while it did get a bit more sweet near the bottom, the drink itself could please a sweet-tooth without being overwhelming. ACKC Cocoa is a fantastic local place to gather or go alone to catch up on some reading. What I really like is that they showcase locally made products, such as the line of Kingsbury Chocolates, Christopher's Confections and Chocolaterie Wanders in addition to sweet and savory pastries from Buzz Bakery. They also carry international chocolates such as Michel Cluizel and Vosges. 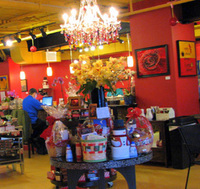 With hours which span from early in the morning to late at night, ACKC Cocoa brings a taste of Europe to Logan Circle. *For you last minute Holiday gift shoppers, ACKC Cocoa Bar is offering a Chocolate of the Month Club and will be holding chocolate-making classes (inquire at www.artfullychocolate.com) after the New Year when production of truffles moves to D.C. from Alexandria. 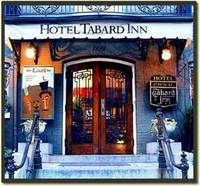 Tucked away on a quiet block of N Street just south of Dupont Circle, the Tabard Inn is one of those places that you don't quite discover until you've been in Washington for a while - and then you wish you had known about it forever. The hotel has 40 guest rooms spread out across three adjoining townhouses, and each room is uniquely decorated. Looking out a south-facing upstairs window at the dome of St. Matthew's Cathedral, it is easy to imagine yourself in some picturesque Italian village. But the Tabard Inn is not just a Hilton alternative - its restaurant boasts the talents of Huw Griffiths, the man recognized by the Restaurant Association of Metropolitan Washington as 2007 Pastry Chef of the Year, and its cozy parlor is a great place to curl up with a hot beverage and one of his creations on a cold evening. Although the restaurant's main courses left something to be desired on a recent visit, the starters and desserts definitely saved the day. To get to the Tabard Inn's eponymous restaurant, you pass through the lobby of the hotel and into a parlor that is dominated by a stone fireplace and its massive wooden mantle. Chairs and benches throughout the dark-paneled room provide plenty of space for people waiting to be seated in the restaurant, but I would highly recommend a visit for the sake of the parlor itself - a limited menu of light fare and desserts is available from an attentive waitstaff. My wife tried the Hot Buttered Rum despite the fact that she is not normally a fan of rum, and she thought it was absolutely amazing. I enjoyed a hot apple cider spiked with Knob Creek bourbon instead of rum - a special request that they accommodated without hesitation. What a great way to start! We were encouraged to let the hostess know when we were ready to be seated for dinner, a nice change of pace from overbooked restaurants who make you wait while they hurry other diners out. Once we did so, we were quickly shown to a table in a small upstairs dining room (not the main room) with views of the Inn's courtyard through the nearby windows. Our server quickly and ably walked us through the menu and informed us that there are no off-menu specials because new menus are printed every day. She also pointed us toward a short list of wines that are imported directly from Italy by the hotel. These represent some great values, but the unique relationship between the Tabard and the growers means that you'll have a hard time tracking the wines down later should you want to buy them yourself. We shared a bottle of Deltetto Roero Arneis, a crisp white wine from Roero in northern Piemonte that was wonderful with our various seafood and pork dishes. A generous basket of bread was brought to the table once we had placed our orders, and this was our first introduction to Huw Griffiths' skills. The basket contained several slices each of light rye, focaccia and sourdough olive breads, each handmade by the pastry chef that day. Although one of my dining companions found the focaccia a bit too salty for her taste, we all agreed that the breads were delicious and lived up to the hype. Soon after that, our appetizers arrived. With several salads, soups and hot dishes ranging from $7 to $11, there are plenty of choices to tempt you, and you would be wise to start with something. An arugula salad that featured roasted pears and pine nuts had its sweetness nicely tempered by a balsamic vinaigrette, and fried gingered calamari were light and tender - though none of us could detect the ginger. My favorite starter was a combination of mussels and spicy lamb sausage served in a silky curry sauce that was rich with a subtle heat. A garnish of watercress lent a fresh, peppery note that complemented the dish nicely. To this point, the meal was wonderful. Unfortunately, we had decidedly less luck with our entrees. Despite a wide variety of dishes (10 choices in all, ranging from $21 to $33), there were very few that begged to be tried. My mother opted for a seafood gumbo that featured house-made creole sausage. Though the sausage was tasty and the seafood well-cooked, there was something about the flavor of the gumbo that seemed out of place - a dusky smokiness that none of us could recall in other gumbos we had eaten (and preferred). My wife's tagliarini pasta suffered from too much salt - despite the inherent saltiness of the squid's ink used to color the pasta as well as the scallops and the grilled calamari, the dish was topped with a spoonful of trout roe that only added to the overly briny flavor. I ordered a suckling pig roulade that was topped with a deliciously tangy fig gastrique, but I was disappointed by the meat used - the cut of pork I was served was at least 1/3 fat, and the skin had a soft, chewy consistency. Only my aunt's crab cake was an unmitigated success, with large lumps of sweet crab meat barely held together by any filler at all and served with a wonderful remoulade. We had been warned to save room for dessert, because Huw Griffith's pastries and cakes are truly the stars of the show (desserts run $7 to $10). A pear tarte with an airy pastry shell came with a scoop of house-made maple ice cream, and the flavors were amazing. A vanilla and malt cheesecake with a banana creme anglaise was decadent and too rich for any of us to finish. 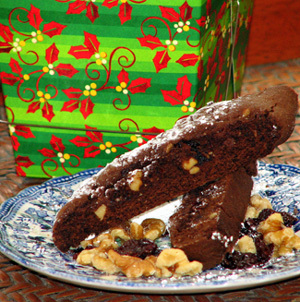 A tall slice of moist chocolate cake was served with a scoop of mint-chocolate chip ice cream that tasted like garden-fresh peppermint, instead of some artificial mint flavor. But the true standout of the evening was the pumpkin pecan bread pudding, accompanied by dulce de leche ice cream. Picture a warm, sweet, gooey confection with a base of house-baked bread tempered by savory spices and you've got a good idea of just how wonderful it was. Any disappointments brought on by our entrees were momentarily forgotten over dessert. Unfortunately, the main courses were not the only disappointment. Service during this trip was surprisingly uneven, as well. At no point in our meal did our server stop by to check on us, save to present the dessert menus. We went through the entire meal without having our water glasses refilled once, only to have them topped off twice during dessert. And, most disturbingly, all of my companions' dishes made it to the table a full five minutes before my roulade, leaving them to look at their cooling plates of seafood while they politely waited for my dish to arrive. All of this despite the fact that the restaurant was not full at any point during our two-hour meal. 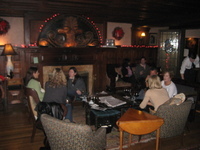 As I said at the beginning of this post, I consider the Tabard Inn one of Washington's hidden gems, and I always look forward to visiting when the weather turns cold so I can enjoy the warmth of the fireplace in the parlor. The romantic appeal of the Inn cannot be overlooked, either, which is why I have often recommended it to friends as a great 'special occasion' spot. But I have found the quality of their main courses to be steadily declining over the past year or so. The desserts and hot drinks (our server informed us that Griffiths was responsible for the fantastic Hot Buttered Rum, as well) remain reason enough to visit, but there is too much competition in this price range for the kitchen to turn out unimpressive dishes like the ones we had. Parking: Valet parking is available for dinner patrons for $7. Street parking is available nearby but can be difficult to find due to the proximity to Dupont Circle. Reservations: Taken and recommended. Tabard Inn is not currently part of OpenTable. Baby-Child friendly Rating: 0 diapers (to borrow Jason's system). The quiet and somewhat romantic atmosphere coupled with the limited child-friendly menu options make this a bad choice for families with small children. Bathroom Rating: Two small unisex bathrooms are both clean and well-kept. A framed letter on the wall from one of the vintners whose wines they import directly reflects the special relationships that go into their wine purchases. It was about a year and a half ago that Cowgirl Creamery opened its doors, and they have more than earned a place in the hearts of gourmets and cheese-lovers alike since then. More than just a place to find wonderful artisanal cheeses, Cowgirl is a D. C. Foodie's dream when it comes to a wide range of hard-to-find items: salames and other charcuterie from well-known producers like Fra'Mani, Bread Line baguettes delivered fresh daily, even salt-packed capers (so much better than the ubiquitous brined capers found in jars on grocery store shelves)! Throw in a small but thoughtful selection of wines hand-selected by the proprietors, and you've got the makings of a decadent picnic or a killer wine and cheese party. Cowgirl Creamery is not the typical DC cheese shop for several reasons. First - it's not a locally-owned business. Cowgirl Creamery was started in Point Reyes Station (north of San Francisco on the California coast) in 1997 by two women with DC roots, Sue Conley and Peggy Smith. Thankfully for us, those roots made Washington the site of Cowgirl Creamery's first expansion outside the San Francisco Bay area. And the fact that a number of Washington restaurants (including the Clyde's group) were already featuring Cowgirl cheeses couldn't have hurt, either. Second - Cowgirl Creamery only features artisanal cheeses. You won't find any mass-produced cheeses like Parrano here, though the women behind the counter are likely to be able to offer two or three artisanal alternatives for any cheese you can think of. On each visit I've paid to Cowgirl Creamery, I've been struck by the presentation of their cheeses. Walking through the narrow store to the back, you are immediately greeted by a long counter covered in firmer cheeses - cheddars, aged gouda, grating cheeses. Passing around to the front of this counter, guests are greeted by a deep refrigerated case holding blues and semi-soft cheeses that would not stand up to room temperature storage. In the far back corner of the room, a separate case holds rounds of goat cheese, clabbered cottage cheese, pates, and cured olives - this one always brings a smile to my face with its assortment of artisanal treats. Previously wrapped cheeses (such as Cowgirl Creamery's own MT Tam, Red Hawk, and the amazing fall/winter seasonal Pierce Pt) can be found in the front of the store with the charcuterie and previously weighed packages of cheeses and accompaniments that are perfect for a grab-and-go purchase. The service at Cowgirl Creamery is top-notch. Not just knowledgable, everyone I've ever spoken to has been truly enthusiastic about cheese. They don't just offer you samples - they practically force them on you. Questions are welcomed and approached as an opportunity to share something new, not as an inconvenience that slows down the transaction. As you might expect, this can lead to lengthy interactions and occasional backups, but the number of employees working at any given time seems to take this into account and addresses it quickly and efficiently. Prices at Cowgirl can be a bit higher than those at competitors around the city sometimes, but for me this is offset by the unique complementary products they carry. There is a massive tank of McEvoy Ranch olive oil located just to the left of the cashier's stand, and they encourage guests to sample this deliciously pure California gold. A freezer case behind the register carries gelatti from DolceZZa, a Georgetown purveyor of the Argentine version of this rich treat. It is also justified by their service and their willingness to go the extra mile in helping their customers to discover new favorites that may lie just outside their comfort zones. The commitment to making and selling true artisanal products at Cowgirl Creamery should appeal to those foodies who wish to encourage and reward producers who are working to preserve traditional methods, and the taste and quality of those products should appeal to just about everyone else. An early arrival in a neighborhood that is quickly developing a character that appeals to both tourists and locals alike, Cowgirl Creamery is still a bit off the beaten path (though just a block away from Ford's Theater and the new Madame Tussaud's, you really need to know it's there to find it). But it's well worth the trip. Every year around this time the wine world is turned on its ear by the yearly reemergence of Beaujolais Nouveau. Touted as the "first wine of the vintage," brightly labeled and (this year) proudly emblazoned with a big "2007," you find ostentatious case stacks of this fruity brew all over the place clear through December, promising a delicious quaff of banana and bubble gum. Though the hook that they dangle is so, so shiny, I implore you, do not bite! When you look through the hype and fanfare, there really isn't much substance to Beaujolais Nouveau: it's fine for a night of drunken revelry (though beware the next morning! ), but its lack of character leaves its popularity unjustified. In a sense, Beaujolais Nouveau is to wine what Bud Light is to beer—the analogy works on several levels. Bud Light is the hardest working Clydesdale in Anheuser- Busch's ample stable. As the best selling beer in the United States, Bud Light is easily AB's biggest money maker—that profit margin made all the greater thanks to the massive amount of rice used in its formula, which is both less costly and less tasty than barley. Also, with an IBU ("International Bitterness Unit"—essentially a measure of hops) of 6.4, Bud Light is one of the least flavored beers in the world. Similarly, most of the grapes that give us Beaujolais Nouveau come from the subregion of Bas Beaujolais, a late addition to the appellation whose soils, while more fertile, are less suitable for growing quality grapes. Also, to get the product on the market as fast as possible, expensive and flavor-imparting practices such as aging are left by the wayside. This is all done at the behest of the negociants, huge bottlers and blenders of wine who have all but complete control of wine production in the Beaujolais region. In order to get Beaujolais Nouveau to market by the annual release date (the third Thursday in November), the first batch is shipped by air, a laughably expensive treatment for a wine whose pedigree is no better than your average table wine. Just as Bud Light's near-beer flavor doesn't merit the six-dollars-a-sixer price tag earned by its marketing, neither does Beaujolais Nouveau's speedy transatlantic voyage make it taste anything like a $12 bottle of wine. While I wouldn't make the claim that Bud Light is really going to overpower your meal (unsalted rice cakes, anyone? ), it doesn't bring much to the conversation, either. 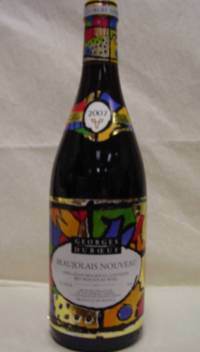 Here Beaujolais Nouveau is actually the greater offender—its lack of body or tannin make it unsuitable with hearty fare, while its flamboyant bouquet and flavor will render lighter cuisine inert. This last point is the biggest shame of all. Bud Light bears little or no resemblance to the Czech lagers of yore from which it was spawned, the quality of which might be seen in such beers as Czechvar (nee "Budvar" prior to a legal scrape with the domestic giant) or Czech Rebel. Likewise, compared to the quality wines coming out under the more illustrious Beaujolais labels, Beaujolais Nouveau is under performing dreck, giving its brothers a bad name. Like Bud Light, Beaujolais Nouveau is a populist and exploitative version of what is in fact a fine and respectable product—but rest assured, the real thing is out there, and it is great! Proper Beaujolais, like all good wine, is expression of both grape and soil. In the southernmost part of Burgundy (the greater area being home to the most prestigious Pinot Noirs and Chardonnays in the world), the Gamay grape is cultivated on granite hillsides. Like its more recognized, under-aged cousin, proper Beaujolais is often possessed of that same banana/cherry character, but it Is more restrained and there are other characteristics to speak to it, including a brisk mineral component and ample acidity. Chateau La Chaize Brouilly 2005 (about $13)—Hard to miss with its distinctive bottle shape, this wine has a wonderful red cherry nose, a medium body with just the hint of mineral on its respectable finish. The big fruit and moderate tannins make this a great pair with poultry with fruit sauce (duck l'orange and the like). J.P. Champagnon Fleurie 2004 (about $18)—Light strawberry and grainy nose with a gamey, meat-like hint. Light bodied, with a classic granite presence on the palate along with persistent red fruit. The finish is long and pleasant; try this one with a milder aged cheese such as gouda, or with a pork based main course. Louis Jadot Chateau des Jacques Moulin-a-Vent 2005 (about $25)—Moulin-a-Vents are the big boys of Beaujolais, often yielding wines with aging potential up to a decade! This particular offering from one of the region's biggest producers offers up darker fruit flavors and fuller tannins while still making clear its origins with that vibrant acidity and mineral element on the finish. A really versatile wine, this one is big enough for a sheep's milk cheese, but not so bulky as to overpower an oily fish like salmon or eel. Incidentally, this producer makes a fine Beaujolais-Village (the second highest regional designation, after the crus), which is widely available for about $10 and makes for a great introduction to the real flavors of Beaujolais. So I urge you to resist the dazzling colors and the ubiquitous hype of Beaujolais Nouveau and instead try a wine made in the true spirit of the drink: to create a quality beverage which proudly bear's its origins in the tasting, and will add flair and spirit to your meal. There are myriad great wines out there, Beaujolais and otherwise, which are more deserving and will be more rewarding of your hard earned cash.